The petition asking for an injunction says that Treaty 8 First Nations will suffer irreparable harm that cannot be mitigated by damages if the ground clearing and nest destruction goes ahead. “Of particular concern is the clearing of the South Bank of the Peace River Valley, which represents extensive, severe and irreversible losses to ecological and cultural resources that support the meaningful exercise of Treaty rights,” it says. Consultation on the permits allowing the nests to be removed was inadequate and BC Hydro proceeded with an “aggressive timeline for consultation,” according to the documents. The plan to remove up to 28 nests between September and March, once the nests have been confirmed as inactive, means time is short. “We are hoping that injunction happens sooner rather than later,” Treaty 8 First Nations member Susan Auger, said in a video made by Common Sense Canadian publisher Damien Gillis during a cultural demonstration on the banks of the Peace River earlier this month. “Eagles are something that are very significant to myself and my culture. It’s something that has got my blood boiling that they are going to come and cut down eagle nests,” she said. Studies show that there are 25 active eagle nests in the dam area, representing half of the large raptor nests in the Peace River corridor between Hudson’s Hope and the Alberta border. However, BC Hydro plans to compensate for the removal or destruction of the nests by installing 38 artificial nesting platforms. “Where feasible and safe, nests will be removed intact and relocated and installed on nest platforms,” says the BCHydro letter. It’s a solution scoffed at by George Desjarlais of West Moberly First Nation. “I don’t know how they communicated with the eagles, how they spoke to them and got them to understand that this is your new home,” he said during the demonstration. BC Hydro spokesman Dave Conway said that during Site C construction, BC Hydro will take great care to avoid or mitigate effects on eagle nests. “During construction, we will not disturb active eagle nests and will only relocate eagle nests when they are inactive, as confirmed by a qualified professional,” he said in an e-mailed statement. 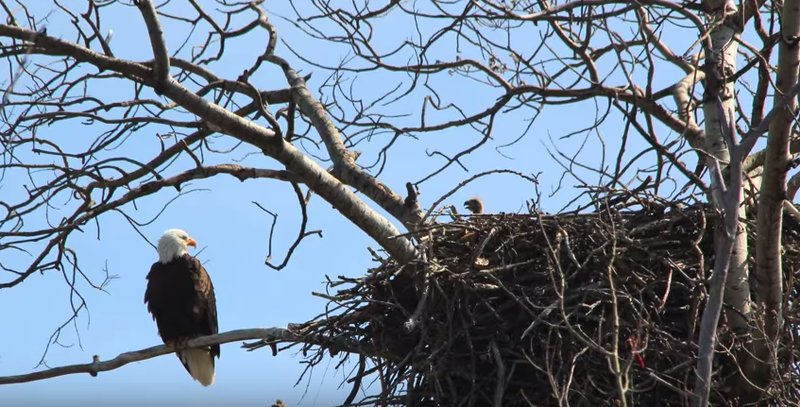 In the Gillis video, Art Napoleon of Saulteau First Nation looks out over the north bank of the Peace River and points out that each island contains eagle nests. “There’s no need for it,” he said. The First Nations are fundraising for the legal challenges through the website nosite-c.com. “We are closing in on $100,000 and our goal is $250,000,” said Susan Smitten of the group Respecting Aboriginal Values and Environmental Needs (RAVEN).